Quick, what’s the first thing that comes to mind when you think of summer in Michigan? Aw, c’mon…did you really just say “orange barrels?” Isn’t it time to think outside the asphalt? 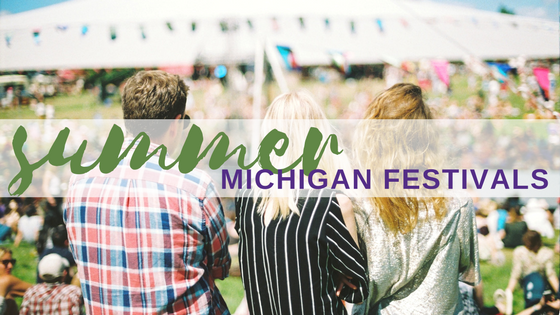 Everyone knows summer is festival season in Michigan! “If you seek a pleasant peninsula …” well, you already know where to look. But if you seek a celebration of baby food, magic, bologna, or llamas…scroll down. There’s a festival for that and a luxury motorcoach to get you there. Fremont, Michigan, population 4,050, is home to the Gerber Products Company — beloved producer of pureed peas, strained squash, and those little pink hotdogs in a jar — making it the Baby Food Capital of the World and site of the annual National Baby Food Festival, a four-day celebration of all things baby. There are the usual baby-oriented events and activities like the kid's zone, community picnic, baby crawl, free entertainment, arts & crafts show, farmers market, Corporate Olympics, bed race, car show, frog jumping, turtle racing, hula hooping, baby food eating, and just an all-around great time! Fremont is in Newaygo County, between Muskegon and Ludington, with 356 river miles, 256 inland lakes, and proximity to Lake Michigan beaches and the Manistee National Forest. When you attend the National Baby Food Festival, be sure to spend some time window shopping in Fremont’s charming Main Street district and sample a local brew at one or more of the area’s breweries. Feel like you’re full of bologna? Well, you’ll be in good company at the Yale Bologna Festival, an annual tradition since 1989. Yale, Michigan (population 2,000), located at the bottom of the thumb region in St. Clair County, is the unofficial bologna capital of the world. So, as you can imagine, the townspeople take their bologna and its festival pretty seriously (if your idea of “seriously” includes an outhouse race, bologna sandwich eating contest, and the crowning of a King and Queen of Bologna). Along with these solemn events, the festival also features a cardboard boat race, a street dance, fireworks, food vendors, live music, and a parade down Main Street. When you visit Yale this summer, stick around to explore the Blue Water Area — 140 miles of shoreline on Michigan’s eastern “sunup” shore — famous for its lighthouses, museums, wineries, beaches, trails, water sports, and many of the state’s berry farms, wineries, and apple orchards. The Abbott Get-Together Convention, sponsored by Abbott’s Magic Company in celebration of its 81st anniversary. The get-together is a gathering of professional magicians and a profusion of magical events: shows, lectures, street performances, fireworks, talent contests, and even an arts and crafts fair sponsored by the Friends of the Colon Library. When you visit Colon this summer, stay a while and make a little magic of your own. Situated in southwest Michigan on the Indiana border, Colon Township's 1,000 acres of water (eight lakes and the St. Joseph River) offer boating, swimming, fishing, beaches, and every imaginable water sport (from tubing to water-skiing). There are campgrounds, picnic areas, historic walking tours, and shopping. If you are a “llama person,” you already know fact from fiction when it comes to these cuddly, smiley-faced members of the camel family. For example, you know that llamas are social animals that live in herds, within a family group, and that they only spit and kick when they feel threatened or need to discipline a lower-ranking member of the herd. If you’re a breeder or owner, terms like “get of sire,” “kush,” and “pronking” roll right off your tongue. You probably even know why llamas hum. For the rest of us, the cool thing about the annual Llama Fest — the largest show of its kind and one of the longest-running in the country — is that it caters both to owners and the general public. Along with watching llamas and alpacas strut their stuff in the ring, visitors to the Llamafest can enter a costume contest, and shop for unique llama- and alpaca-themed gifts. When you go to Michigan State University for the Llamafest, you owe it to yourself to take a tour of the nation’s first land-grant university. Beaumont Tower, with its 47-bell carillon, marks the site of College Hall, the first building in America erected for the teaching of scientific agriculture, and is a must-see. National Superconducting Cyclotron Laboratory, where you can also learn about the new Facility for Rare Isotope Beams or FRIB. There you have it, all the ingredients for a memorable getaway for your group this summer. Start with a Michigan festival — the quirkier, the better. Mix with a delightful location in a beautiful part of the state. Add a group of people who enjoy being together. Fold in any combination of festival-going, shopping, dining, sightseeing, exploring, relaxing, and playing in the great outdoors. Top it off with a luxury motorcoach to get you and your group everywhere you want to go—safely, efficiently, and cost-effectively. Try it. Tweak it. Tell us about it. And be sure to file it with your favorite recipes for quintessential summer fun in Michigan.